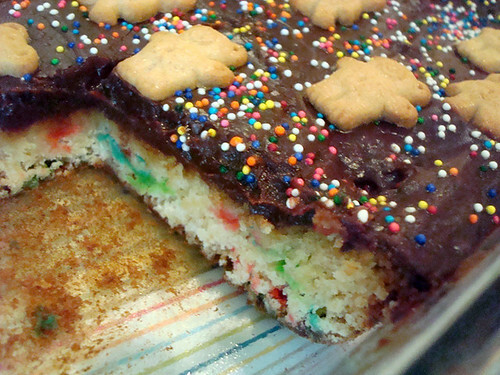 Certainly, if there were an Official List of Things That Are Grand and Mighty, the following would be on it: Funfetti Cake Mix, Sweetened Condensed Milk, Chocolate Fudge Frosting, and Teddy Grahams. So you can imagine how wealthy in sweet riches I felt when I found myself in possession of all of these things, at once, in my kitchen, at the ready. Knowing that I needed to make the most of this precious bounty, I thought long and hard before settling on the ideal concoction: a Sweetened Condensed Milk Cake. I quickly found a recipe on this forum which detailed how to trick-out a cake mix with sweetened condensed milk for a decadent treat, and was delighted to see that I had all of the ingredients on hand. Now, the recipe I started with was somewhat like Houdini Bars--a cake mix crust, but with a sweetened condensed milk and chocolate gooey topping. But what the heck, I thought, and decided to pour in the sweetened condensed milk right along with the cake mix and see how it baked up. And you know what? It worked! 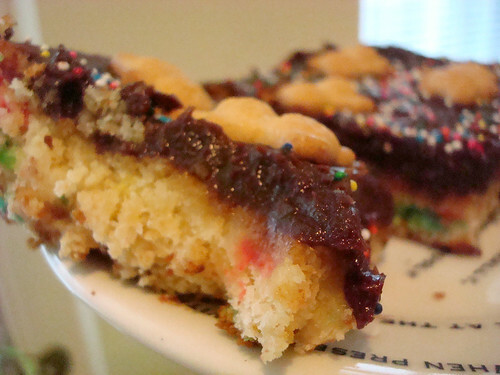 The resulting cake was very dense, more like a bar cookie texture; the taste was heavenly sweet, with that lightly caramelly-milk tasting flavor that the sweetened condensed milk so deliciously imparts. So rich. You really shouldn't eat a lot of this. Just kidding. Eat more. 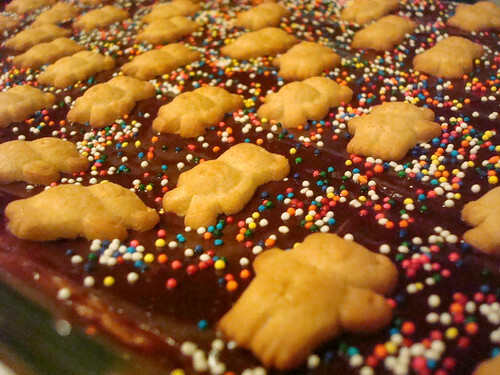 And in a case of pure gilding the lily, I added an extremely thick layer of fudge frosting on top of it all, and since they were on hand, gently placed Teddy Grahams on top. Now, it wasn't my intention, but with those Teddy Grahams gently resting on top of the cake, waiting for their final resting place in the greedy mouth of various sugar fiends, something was pointed out to me by the creators of The Sporkful. These teddies resembled the rows of soldiers so dramatically captured in Gone With the Wind! So I started to think of it as a Teddy Graham Graveyard. So, that's my secondary title for this cake: Teddy Graham Graveyard Cake. Preheat oven to 350. Grease a 13 x 9 x 2 inch baking pan. In a large mixing bowl, beat the cake mix, eggs, oil, sweetened condensed milk and melted butter in a large bowl with mixer until blended. Pour into the prepared pan. Bake 20 to 25 minutes until lightly browned. While the cake cools, prepare the frosting. 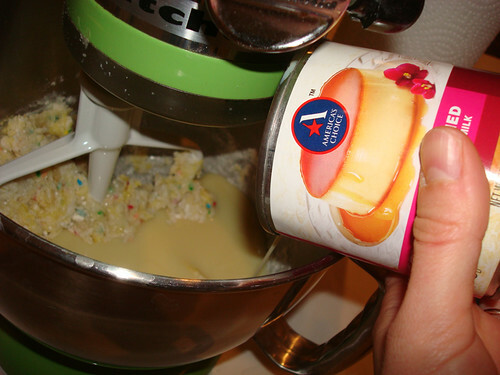 To make the frosting, in a stand mixer fitted with the paddle attachment, cream the butter on high speed until smooth, about 1 minute. In a separate bowl, sift together 3 cups of the confectioners' sugar with the cocoa. Add the sugar and cocoa mixture to the butter mixture in 2 to 3 additions, beating on low speed to incorporate. Pause to scrape down the sides of the bowl with a rubber spatula after each addition. Add the salt, vanilla, and cream; increase speed to medium, and beat until the mixture is very fluffy a spreadable consistency. If the frosting is too soft, add a little more sugar; if it's too thick, add additional cream in small increments, mixing after each addition, until it has reached your desired consistency. 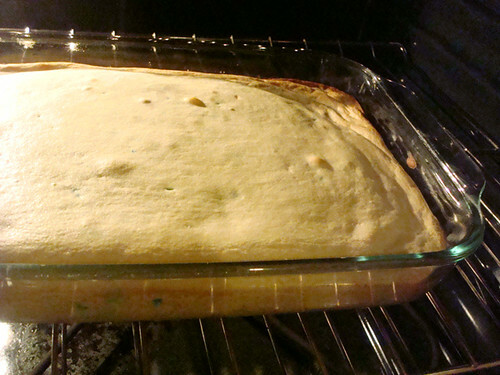 Frost the cake all over, right in the pan. It's gonna be a lot of frosting. 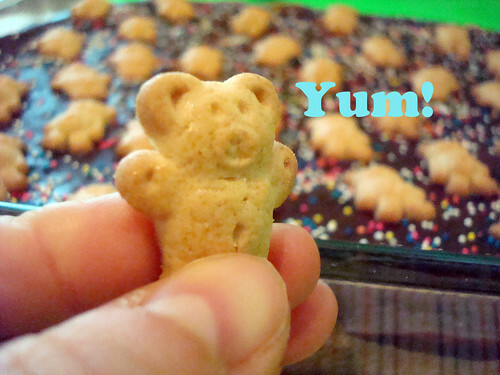 Sprinkle with nonpareils or sprinkles of your choice, and don't forget the Teddy Grahams.